The Japanese Ambassador to Ireland, Ms. Mari Miyoshi, attended a lunch at WA Café on Saturday, 19th January. 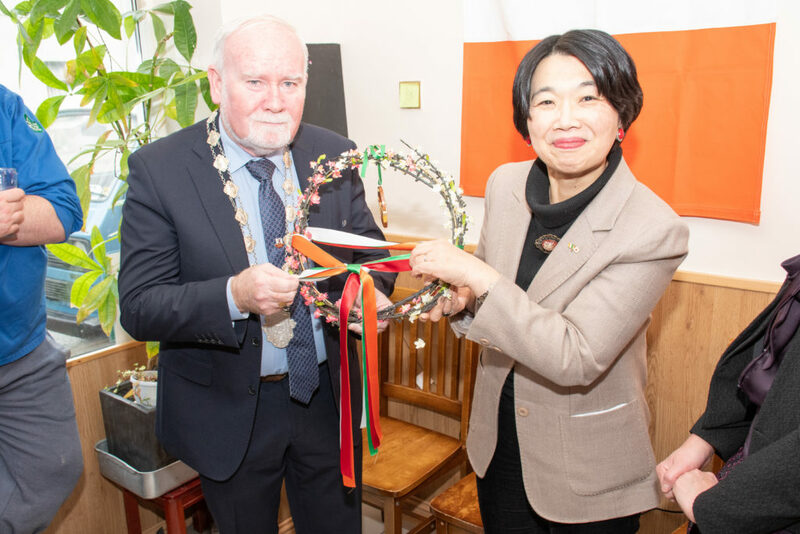 The En-Musubi Gathering, which means ‘connection tying’, aims to strengthen the ties between Japan and Ireland - to expand links in cultural, business and economic activities and to increase even more the relations between the two countries. The event was attended by people working within academia, cultural and business activities between Ireland and Japan. At the ceremony, Deputy Mayor of Galway, Cllr. Donal Lyons; Japanese Ambassador, Ms. Mari Miyoshi; tied a ribbon in the colours of both Ireland and Japan to mark the occasion. In her address to those present, Ms. Miyoshi said she had also attended Akumakon in NUI Galway earlier in the day. The Ambassador said she was both delighted and privileged to see the strong connections between Galway and its Japanese community. Akumakon’s Co-Director, Sarah Brady, was also in attendance at the ceremony.